Placed in the Akmani Hotel Wahid Hasyim. The event start on 1pm - 4pm..
Cosmekita Launching Premier open event to celebrate their new website promotion about beauty product shopping online..
Cosmekita hold their expert beauty from Japan and Indonesia Makeup Artist International.. Beauty experts came and shared about beauty tips and trick.. and also how to make simple hair do for Indonesian girls..
and also invited 50 beauty bloggers and vendor who is having collaboration working with Cosmekita..
Cosmekita is beauty community website which having collaboration with bloggers, readers/ users, online shop and vendor. The aim from cosmekita is to building community having connection one and the others, make it easy to all users to find out about product, review, and even online shop. so let's together spread this community and giving information to others with cosmekita concept: CREATE. BEAUTY. TOGETHER. How was the event going? 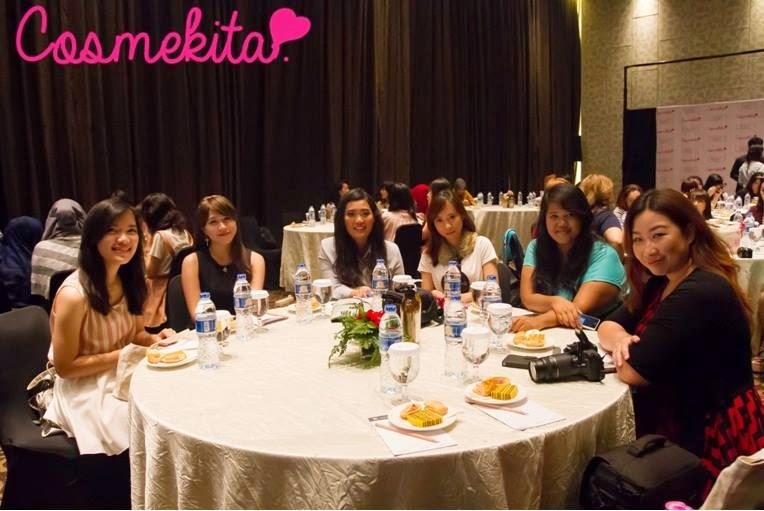 we are so full now.. and then we back to the ballroom to start the event..
cosmekita invitation so cute and adorable for sure! opening start it by the master of ceremony or A.K.A MC..
and then continue with Ms. Kamila who is the owner of Cosmekita Website..
and another speech from Mr. Kenny about explanation more details Cosmekita Website..
and video from Ms. Sanny lie who is cant joined with us with one and another reason..
and the next event, we continue with makeup tutorial and hair do by beauty expert..
or you can call it as workshop beauty makeup class..
Cosmekita invited beauty expert from indonesia and also japan..
they are Olga, Mr. yamano and mr. yazawa.. Makeup Artist From Indonesia: Olga Agradia D.
first olga agradia open the beauty demo in front of the public..
she is taught us how to make a beautiful eyebrows and also another beauty tips for beauty bloggers..
its so great tips from her..
and also olga is working at Anastasia Beverly Hills as a makeup artist..
after olga agradia finished her demo! and then we got another beauty expert from japan! this is bottle is the most famous hair shampoo and treatment from japan..
with the good quality always sold out in japan..
After mr. yamano and mr. yazawa done with makeover the models..
they are standing around the beauty bloggers closer..
as you can see over there, there is gold tatoo shining from the models..
they said its made by 100% gold..
and easy to apply it..
and once again it most popular tatoo at japan..
i cant imagine how much does it cost..
they are not even mentioned the price..
and by the end of event, cosmekita having a grand prized.. thats samsung note 8..
ah what a pity they are not picked my number ..
so sad we must go home.. but we still connected each others on cosmekita officially website. absolutely crowded and long line queue..
everybody so happy and open theirs one by one..
it's so amazing event and opportunity can joined with Cosmekita Launching Party Event..
My OOTD: Blue and red jeans with the long dark hair..
How to contact Cosmekita Further? and before we go home..
Cosmekita with generous gave us the gift thanks for us ..
look at those cute little baby..
girls, you are gonna jealous for this ..
and soon or later i will and must make the review all this beauty product..
so stay tuned on my blog! Congratulation for Launching Premier Website Cosmekita..
for the experienced and also learning from the expert make up artist international ..
KEEP IT ON guys to make all the girls over the world beautiful..
keep it up your work crew team from Cosmekita.. stay together! together we can do! !